On March 7, 1965, hundreds gathered at Selma’s Brown Chapel A.M.E. to push for voting rights and protest the state trooper killing of activist Jimmie Lee Jackson. They united for a days-long march to Montgomery, Alabama. But at the end of Selma’s Edmund Pettus bridge, they faced terror and violence. A wall of troopers, deputies and others rained blows on the peaceful marchers and flooded them with tear gas. That horrific day was called Bloody Sunday. Lynda Blackmon Lowery was the youngest person there. 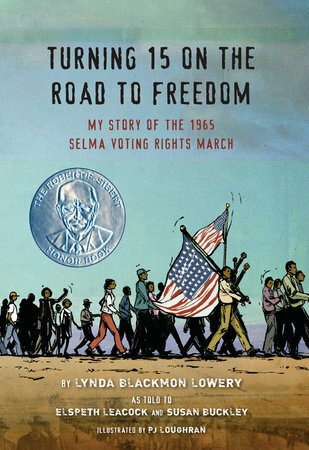 Her memoir, Turning 15 on the Road to Freedom: My Story of the Selma Voting Rights March (Dial, 2015), is her testimony. The oldest of four children, Lowery grew up in a loving, close-knit black community where everyone helped and looked out for each other. But though she felt safe at George Washington Carver Homes, the ugliness of racism was all around her hometown of Selma. “When my mother died,” she recounts in the book, “I heard the older people say, ‘If she wasn’t colored, she could have been saved.’ But the hospital was for whites only. My mother died as a result of her skin color. I just believe that.” Lowery was just seven years old. Raised by her father and grandmother, she heard the Rev. Dr. Martin Luther King, Jr. speak at church. His impassioned speech for voting rights called Lowery to devote herself to fighting nonviolently for the cause. Before her indelible 15th birthday, Lowery had been jailed nine times. Her powerful story, as told to Elspeth Leacock and Susan Buckley and illustrated by PJ Loughran, shows how young people stood up for what they believed, faced brutality and daily injustices and made a difference by putting their lives on the line. It presents living history on the page. Winning starred reviews, numerous best book accolades and the 2016 Robert F. Sibert Informational Honor Book Award, Turning 15 on the Road to Freedom gives an incredible window into a pivotal historical event and shows kids that they can be heroes too. We are proud to feature Lynda Blackmon Lowery as our honoree for Day 19. Can’t imagine turning fifteen while in the middle of all of this, and already having gone to jail for protest myriad times before then. I hope to see more and more of these first-person books coming out – people need to tell their stories and we all need to hear them and not lose any more to time and distance from the event.